It’s hard to believe that summer is half over already! In just a few months it will be time to pack up and head to Virginia Beach for the Art & Soul Retreat! It is absolutely my favorite artful adventure of the year! Where else could you find so many like-minded folks to play with? The week is filled to the brim with fun! Artists come from all over the world to teach classes on everything from metal to fiber. The students flock in from all over too — to learn from the best, meet the art stars, commune with friends and party on! In the past I have taken classes on wig making, still life, mixed media, soldering, landscapes, assemblage, mold making, 3D animals and more. I got my posse to help me out by trying the techniques on their own jeans– and of course, each of them went in an entirely different direction with their pair. Kat (the amazing fiber artist) went straight for applique and embroidery. Terri did an awesome image of a lion on hers so that she can rock them this fall at the ODU Monarchs football games. Julie went sweet boho-style with lots of patches and Jill threw caution to the wind with brightly colored mermaids covering the entire pair! She recently rocked them at a Journey concert and they got rave reviews! The class promises to be tons of fun and your embellished jeans are sure to become a family heirloom! Come on out and get your groove on! I’m so excited that Jeannine asked me to play this artful Monday Blog Tour! She is my blogging mentor and a fab friend! Thanks for tuning in! I got to attend a Designer field trip to see the giant rubber ducky at the Grand Re-Opening of the Chrysler Museum in Norfolk. I had some folks tell me they just didn’t get what the big deal was about, but that was one seriously BIG ducky! You could feel the excitement everywhere. It was a buzz – a super happy yellow sunshiny buzz. Duck lip selfies were mandatory. And the Chrysler Museum looks awesome! I’m planning another trip there soon. I got to be a part of the new Outer Banks Magazine! Along with building some ads for the product, I was invited to come down to Nags Head for the fashion/cover photo shoot. I got to see how the stylist works with the models, the photographer and the lighting. It was amazing to see the transformation to the finished product. I was also fortunate to be able to put on a training class for the Design team. The theme of the training was something I am very passionate about – lifelong learning! I made them all “Thinking Caps” to remind them to keep their MINDS WIDE OPEN! It was really rewarding to see a bunch of super busy folks wearing silly hats, taking notes and getting excited about learning something new! In my home studio, I paint, do mixed media and make jewelry. I also teach classes. 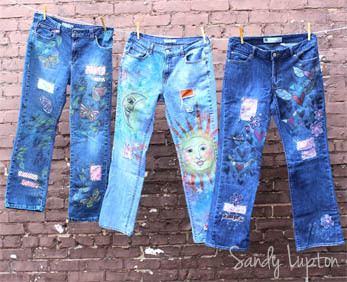 Right now I am working on samples for my Hippy Hippy Shake Altered Jeans class for Art & Soul Virginia. The jeans are addictive to make, and the more you add to them the more fun they are to wear. Layers and layers of color, fabric, and embroidery… party pants! I love bright colors and i try to throw a little humor into each piece – even my jewelry is not too serious. I try to produce art that pleases me, and I don’t worry too much about what other people will think of it. If it sells, that’s great. If not, no worries. I’m better off if I keep my hands busy. I’ve found that the important part is to show up. It is pretty easy to get sucked into the computer (who is not hooked on Pinterest?? so many pretty pictures!!) or TV or cleaning the house. I have to make time to make art! So I punt the rest, and head up to my studio. I start by picking up stray supplies and putting them away and before you know it, I am spreading paint on a canvas or making a dozen pairs of earrings. I leave the projects out so that If I have 15 extra minutes I can head up there and play with them. I work full time outside the studio, so it makes me feel better to be able to sit down and add a little dab of paint during the week. Then on the weekends I can really dig in. That’s enough about me! Now I’d like to introduce you to 2 of my art buddies. They are uber talented and full of creative energy! I am sure you will enjoy your visit with them! Cathy Mendola is an east coast girl that has been transplanted in the midwest and has finally come to terms with the brutal winters. She is a dabbler of many mediums but has a current obsession with beading. Whether it’s making jewelry or creating bead embroidered projects she can’t get enough of it. She is also mildy obsessed with wool & silk fibers and the wonderful combination the two can create through wet felting or needle felting. Come to think of it, there’s not much she doesn’t become obsessed with once she plays with it the first time!